I’ve missed the phenomenon that is Skulduggery Pleasant, so this was a good opportunity to try a Landy novel. This new series is definitely aimed at an older audience, but I thoroughly enjoyed it. Amber is a teen with a bad relationship with her parents. She works part-time at a diner, but one night on her way home she is attacked by two men. Yet she not only fights them off – she does them serious damage. 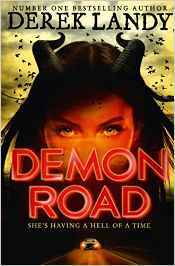 Confused, she heads home where her parents reveal to her the shocking truth – she’s a demon, like them. And what’s worse, in order for them to consolidate their powers, they are going to kill her and eat her. So Amber does the only thing she can – she goes on the run and does a deal with the devil. Accompanied on the Demon Road by enigmatic Milo, driver of a charger with a mind of its own, and by Glen, a garrulous Irish boy who is marked for death, fulfilling her side of the bargain is not going to be easy. Tracking serial killers and monsters across America, the trio encounter some truly scary and gory situations – the doll’s house with its miniaturised dead bodies, the tree witches and their zest for human skin… Deliciously gruesome and very, very violent. And always the threat of her parents right behind her, and the Devil calling in his debt. This is a relentless road trip novel, packed with dark humour and copious amounts of viscera. It’s pacy and full of action, and very, very readable. I loved Glen’s character and was intrigued by Milo’s dark past, and Amber was an engaging heroine, trying to hold onto her humanity while her demon side lusts for blood. 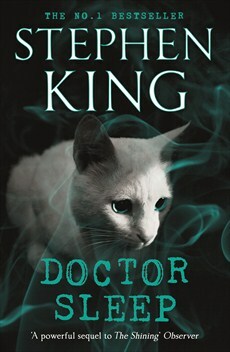 Great fun, and I shall definitely be reading others in the series! Wow, it’s not often I’m so excited by a work of fiction I immediately want to tell everyone I know about it! But this graphic novel has simply blown me away. I like graphic novels but don’t read them too often; Emily Carroll’s Through the Woods has made me think I’m missing a trick here. 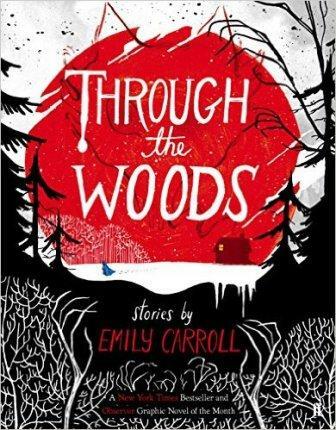 It’s just sublime – five short tales on the theme of what lurks in the dark dark woods, a twist on familiar fairy tales which leaves a delicious shiver down your spine. Little Red Riding Hood is the archetypal fairy tale, so deep with psychological resonances it transcends its medium. Carroll closes her novel with a wonderfully short but utterly perfect take on this story. Her other tales are gothic, disturbing, compelling, and not a word is wasted or out of place. The first two – Our Neighbor’s House and The Lady With Cold Hands – read aloud amazingly well, so rare for graphic novels, and so they are destined to become a staple feature of my book promotions to teenagers. And all the stories are illustrated in just the right mood and tone, adding layer upon layer to the words. Gruesome and unsettling by turns, illustration and writing work in perfect partnership to chill the blood. Utterly exceptional, I highly recommend this spooky collection! I confess to always being a little sceptical when a celebrity turns to writing books for young people, but Simon Mayo has got it right in Itch, the first in a new series of action adventure novels. We start with Itchingham Lofte (Itch) having lost his eyebrows; he burnt them off by accident when he blew up his bedroom, experimenting with phosphorus. But that’s the least of his worries when his obsession with the chemical elements leads him to acquire a rock which is radioactive. His sleazy teacher in particular is very keen to get hold of it. With governments and gangsters on his tail, will he manage to get the rock somewhere safe, save his sister’s life and not die of radiation poisoning? It’s not looking good for our hero… This is genuinely tense stuff, with our protagonist in very real danger. Mayo isn’t afraid to portray serious threat and doesn’t talk down to his audience, making this a compulsive read. (Corgi, 2012, ISBN 978-0552565509). 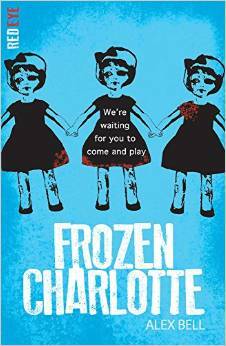 Meanwhile my passion for spooky horror was very well met by Alex Bell’s Frozen Charlotte. Sophie and Jay download a Ouija board app and suddenly everything gets spooky – and by the next day, Jay is dead. Sophie is convinced that the spirit of her dead cousin Rebecca is responsible, so visits her remaining cousins on the Isle of Skye to find out the truth. Cameron, Piper and Lilias are seriously weird, and claim that a collection of tiny dolls called the Charlottes are possessing them… What’s really going on in that spooky house and are the dolls really capable of driving people to murder? This is a truly creepy story with some shockingly violent moments. Not to be read before bedtime! If you find dolls scary like me, this will freak you out. Just my sort of thing! (Stripes Publishing, 2015, ISBN 978-1847154538). 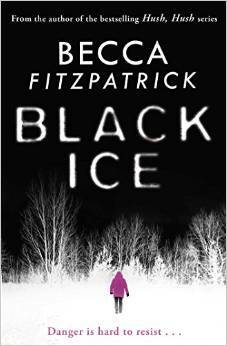 Tension of a different, but equally disturbing kind, is the theme of Becca Fitzpatrick’s Black ice, one for older readers. Britt thinks that one way to get over her broken heart is to go backpacking over the mountains with her best friend Korbie. She didn’t count on her ex, Calvin (Korbie’s brother), tagging along too. But before the girls get to the cabin on the mountains, a snowstorm forces them to abandon their car and take refuge in another cabin, where they meet handsome Shaun and Mason. Something’s not right about these guys… and suddenly the girls are taken hostage. Britt convinces them she knows the mountains well and is their only hope of escaping whatever it is they’re running from. But forced outside, she has to fight to survive, and figures her only chance is to build a bond with Mason. But can he be trusted? Britt has to use every ounce of ingenuity as she tries to outwit her kidnappers, but when she’s falling for one of them, it’s harder to see the truth… Very tense story which I couldn’t put down, with a shocking twist in the tale – I did see it coming, but it was still utterly compelling and in no way spoilt the ending. (Simon & Schuster, 2015, ISBN 978-1471118166). Seed by Lisa Heathfield is one of those stories that makes your skin crawl. Pearl lives a simple life at Seed and is looking forward to the day she’ll become a companion to Papa S. But then newcomers come, and Pearl feels an attraction to one of them, a boy called Ellis. He tells her that Seed is wrong, is evil, and that she must escape – but surely Papa S wants the best for all of them, even though he sends her to the Punishment Room…. A disturbing tale of life in a cult, with a horrifying ending. Not for the faint-hearted! (Electric Monkey, 2015, ISBN 978-1405275385). Tim Bowler is a stalwart of young adult literature and Game changer is another excellent, gripping story. Mikey lives in his wardrobe. It’s safer there. Especially since the last time he dared to venture out, and saw something terrible. But now they know where he is and he can’t escape the flood of text messages threatening to kill him. Even at school he’s not safe. But then they take his sister Meggie, and Mikey is forced to confront his worst fears to try and save her. Gripping thriller that gives you a tense feeling right in your gut, as you wonder if Mikey and Meggie will survive… Impossible to put down, and like Mayo, Bowler does not shrink from putting his characters in very scary situations. (OUP, 2015, ISBN 978-0192794154). Taking a totally different tack from the books above, Jasmine Warga’s My heart and other black holes is a tear-jerker. Aysel (pronounced Uh-sell) wants to end it all, but doesn’t want to do it alone. She meets a boy online who is also looking for someone to help him, and before long she and Roman have made a pact to commit suicide on April 6th. But in spite of herself, she starts falling for him – and realises that she has far more to live for than she ever imagined. But will she convince Roman in time? Very moving story that makes you cry, yet also makes you realise how precious life is; Warga’s story tackles a difficult subject with sensitivity and insight. (Hodder, 2015, ISBN 978-1444791532). 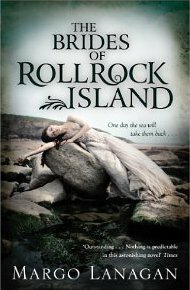 Margo Lanaghan in The Brides of Rollrock Island delves into folklore, another staple ingredient in children’s literature. Misskaella doesn’t look like the other pretty girls on Rollrock Island and is teased and bullied by them. But Misskaella has a secret – she can charm the seals on the shores into shedding their skins and becoming human. To get her revenge on the girls who look down on her, she gives each young man a beautiful seal wife – for a price. But the selkies pine for the sea, and the strange, enchanting seal women of Rollrock Island will find a way to return to the water… A beautifully told tale, quite a challenging read, but if you are enchanted by fairy and folk tales this unusual story will capture your imagination just as Misskaella captures the seal women. (David Fickling, 2013, ISBN 978-1849921121). Melissa Marr is one of my favourite young adult authors and her latest is Made for you. Eva’s the queen bee at school, with a coterie of loyal friends and a handsome boyfriend. Then she’s nearly killed by a hit and run driver. Not only scarred, she discovers that when someone touches her, she has a vision of their death, and not just that – she’s having visions of her friends being murdered. When the visions start to come true, she realises that the hit and run driver was a serial killer – and now he’s obsessed with Eva, and killing her friends to get closer to her. But can Eva’s visions save everyone she loves? And is the killer closer than she thinks? A very disturbing tale about love gone wrong, with adult content. (HarperCollins, 2015, ISBN 978-0007584208). Kim Slater’s Smart is for fans of The Curious Incident of the Dog in the Night time. Kieran is a little bit different, which means that his stepfather Tony and stepbrother Ryan hate him. He spends his time down at the Embankment where he befriends homeless Jean, but when another homeless person is found dead in the river, he resolves to play detective and find out what happened. His investigations will lead him to fall foul of Tony and Ryan even more… But Kieran is different, not stupid, and his quirky view on life sees more than anyone realises. Moving and satisfying story, very heartwarming. (Macmillan, 2015, ISBN 978-1447236672). 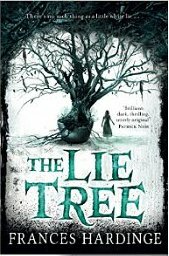 Another delightful spooky tale: Frances Hardinge’s The Lie Tree. In Victorian times, girls weren’t supposed to be clever – and Faith’s a clever girl, who takes after her scientist father. No one listens to her though, especially not her father. But then he then dies in mysterious circumstances, and Faith is convinced he was murdered. She discovers that her father had acquired a rare plant, which feeds on lies, and rewards the liar with visions revealing the truth of things. She starts to tell lies, big, dangerous lies, in the hope that she’ll find out who killed her father; but telling lies changes you. As Faith falls further in darkness, will she find the truth she seeks, and will it be too late to save herself? An unusual thriller with an unearthly twist; I really got lost in this one. (Macmillan, 2015, ISBN 978-1447264101). 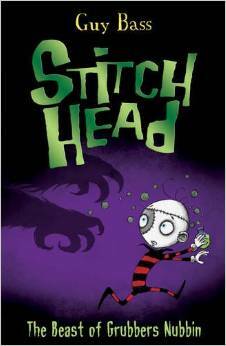 And one for younger readers which I thoroughly enjoyed: Stitch Head: The beast of Grubbers Nubbin by Guy Bass. Stitch Head is a small, gentle monster living in the spooky Castle Grotteskew with lots of other monsters created by mad scientist, Professor Erasmus. Looking after a horde of hungry orphans is no easy task for the monsters; their attempts at cookery aren’t too successful to say the least! So they hatch a plan to steal the villagers’ food, food that’s being saved for the feast of Guzzlin’ Day, but they didn’t reckon on a wild and scary beast getting in their way… Mad and hilarious adventures with Stitch Head ensue! There is a whole series of these and they are a delight. (Stripes Publishing, 2015, ISBN 978-1847156099). Reading Mo Hayder is a singularly visceral experience. I can only describe it as like the bit on a rollercoaster when you’re inching up the track, knowing that any moment you’ll plunge downwards at terrifying speed, leaving your insides miles behind you – the anticipation is terrifying, and the outcome… well. You can work it out. I read Hanging Hill when it first came out and the ending to that story still makes me go ice cold when I think about it – it was a brilliant piece of thriller writing. 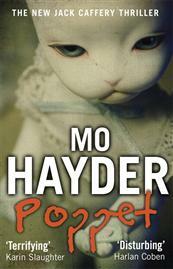 And Poppet didn’t disappoint – I was hooked from the first graphically nasty opener to the shock ending. It starts as a horror story – the residents of the secure psychiatric hospital are being tormented by a small, vicious ghost they call the Maude, which is driving them to self-harm in horrendous ways. But psychiatric nurse AJ LeGrande – Average Joe – isn’t convinced that the cause is supernatural. Could it be one of the patients themselves? Calling on Detective Inspector Jack Caffrey for help, AJ is determined to stop the culprit before anyone else gets hurt. But his mission is complicated by his new romance with the unit’s boss, Melanie, whom he fears may be the next target of the Maude…. Meanwhile Jack Caffrey has his own problems, both with murder and with love. You don’t need to have read the previous books in this series to get a sense of this complicated cop and the moral nightmare in which he’s caught; he’s an intriguing character and his story arc is tense and compulsive.